There are many similar iterations of integrity but the common thread is clear. Growing up in a world which sometimes seems selfish, the youth must mindfully go about their day exercising integrity until it becomes who they are. These bear life’s lessons which many of us learned as we grew up, often through trial and error, triumph and guilt. We can speed that learning curve for our kids and hopefully make it far less painful. Everyone will benefit if we can help keep our youth focused on this early, highlighting it as an integral part of life. We want them to be honest, to do what is right even when no one is watching, to keep their promises, take responsibility for their actions, and never betray someone’s trust. Leaders with integrity give us hope for a just and fair future, for progress, and humanity as a whole. If we can instill such qualities in our youth, the leaders of tomorrow, then we can make the world a better place. I like to think that jiu jitsu can play a role here as it highlights the trust you must earn from your partners, the hard work it takes on the mats every day, and the courage to step onto them in the first place. 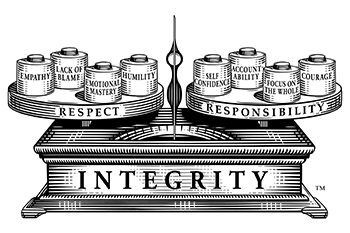 It’s up to us coaches, parents, and youth leaders at the gym and in the community to help instill this concept of integrity and help them develop it in themselves.